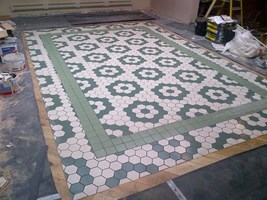 Hi, my name is Ian Sampson, I've been tiling now for near on 30 years, so I'm what's classed as old school. I was taught by a tradesman who was at the top of this trade, and as the old saying goes you're only as good as your tutor! My work speaks for itsself, as every job I do I'm always looking to better the last job, I strive for perfection every time. I have tremendous pride in my work because I still enjoy my job, everyday there are new products and tiles to deal with, which means I'm still learning my trade. I love seeing an old shabby bathroom being turned into a bathroom that is showroom standard, and that's the standard I set myself day after day. I work alone because I simply don't trust anyone with my work, I have a reputation to keep that is second to none. I can also do the complete bathroom refurb from start to finish. Tiles cost a lot of money which I why I make sure my work has no come backs. There are plenty of tilers out there, but there aren't many old school tilers like myself. Trust is a big thing when choosing a tradesman, so put your trust in me, and I will prove myself time and again.